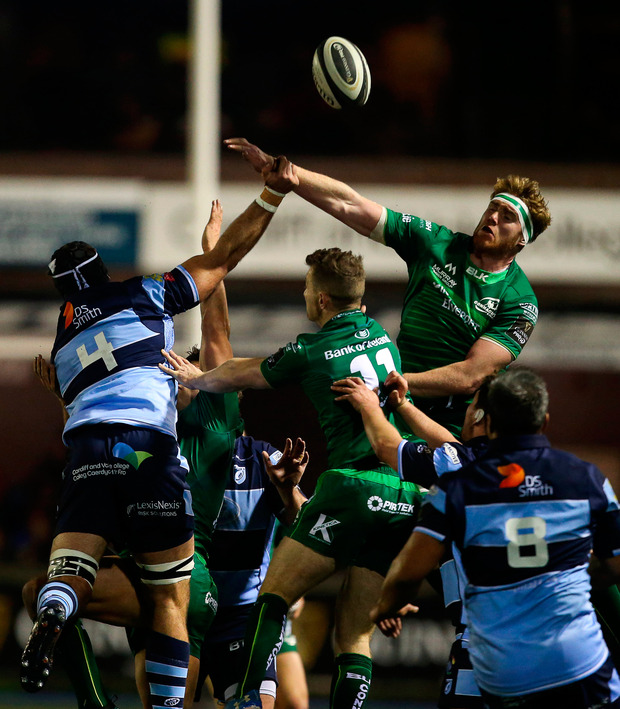 Connacht had to make do with a losing bonus point as they slipped to a narrow defeat in Wales. With the Blues five points behind Connacht coming into this fixture it was an ideal opportunity to put some breathing space between themselves and the Welsh region. But they were far too inaccurate when they had the ball and as a result they slipped to their first defeat in 11 games. Connacht spent the first 10 minutes defending in their own 22 with the Blues applying pressure with their powerful ball-carriers. Steven Shingler opened the scoring with a successful penalty from 30 metres out after Connacht were penalised at the breakdown. The visitors responded with a series of powerful driving lineouts which forced Cardiff into conceding three penalties in succession. With Connacht advancing towards the Blues try line, the referee had no choice but to award Blues loosehead prop Brad Thyer a yellow card for his role in illegally sacking a maul. Connacht soon had a two-man advantage when No 8 Nick Williams was sent to join Thyer in the sin bin after a reckless late hit on Finlay Bealham. But they couldn't take any sort of advantage and instead it was the Blues who crossed the try line during this period. With an attacking scrum just outside Connacht's 22 scrumhalf Lloyd Williams went blindside before offloading to Owen Lane, who skinned two defenders before diving in at the corner for an 8-0 lead. Cardiff started the second half like a house on fire, with Harri Millard cutting the Connacht defence open before offloading to Williams. The scrumhalf was brought down just short of the line but Connacht No 8 Jarrad Butler saved his side with a brilliant turnover. Connacht ensured a grandstand finish when replacement loose forward Paul Boyle crashed over from short range after a period of sustained pressure from the visitors. Conor Fitzgerald nailed the conversion, making it a one-point game going into the final three minutes. The visitors pushed hard in the dying stages of the game but the Blues stayed firm to record an important victory. Scorers - Cardiff: Lane try; Shingler pen. Connacht: Boyle try; Fitzgerald con. Cardiff Blues: M Morgan (D Fish 13); O Lane, H Millard (G Smith 68), R Lee-Lo, A Summerhill; S Shingler, L Williams; B Thyer (R Carre 51), K Dacey (L Belcher 68), D Arhip (S Andrews 63), G Earle (M Cook 63), R Thornton, S Lewis-Hughes (R Carre 18-28) (J Botham 72), O Robinson, N Williams. Connacht: T O'Halloran; C Kelleher, K Godwin, T Daly, M Healey (S Fitzgerald 63); D Horwitz (C Fitzgerald 45), J Mitchell (A Lloyd 49); D Buckley (M Burke 63), D Heffernan (T McCartney 51), F Bealham (D Robertson-McCoy 63), J Cannon (J Makysymiw 69), C Gallagher, E McKeon (P Boyle 60), C Fainga'a, J Butler.